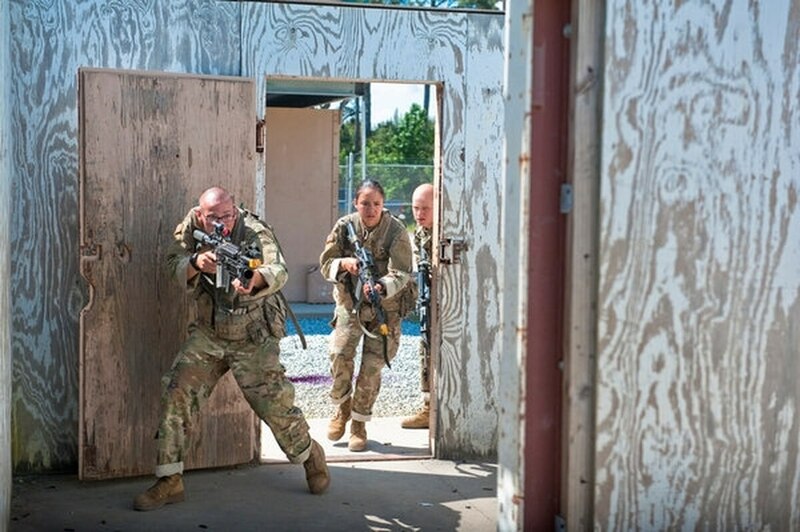 Infantry soldiers-in-training conduct close quarters battle training at Fort Benning, Georgia. The Infantry One Station Unit Training class that graduated on May 19 was the first to include female recruits. By July, more than 400 women had signed up for combat arms, Army officials said. The Army is extolling its “Leaders First” initiative as the reason gender integration is succeeding, but in fact the policy is acting as a barrier to women who want to enter combat arms and is causing resentment among male soldiers. In January 2013, when former Secretary of Defense Leon Panetta eliminated the 20-year policy that prohibited women from serving in ground combat occupations, Chairman of the Joint Chiefs of Staff Gen. Martin Dempsey simultaneously published a set of “guiding principles” intended to ensure successful integration. The last of those principles was a requirement “that a sufficient cadre of midgrade/senior women enlisted and officers are assigned to commands at the point of introduction to ensure success in the long run” and is the basis for the “leaders first” policy. On its surface “leaders first” sounds reasonable and is supposedly based on a “best practice” but there are so many problems with the policy, both practical and cultural, it’s hard to know where to start. For implementation of the policy, the Army decided “leaders first” meant two women officers or NCOs, of any rank, needed to be assigned at the battalion level before junior enlisted women could be assigned. Apparently, new second lieutenants and any reclassified E5 meets the “midgrade/senior” leader requirement outlined by Chairman Dempsey. For the active Army this has meant that brand new women infantry and armor second lieutenants are being assigned to just two brigades, one at Fort Bragg and one at Fort Hood, so entry-level enlisted women can join the same units. However, the Army ended up with more women infantry and armor officers than anticipated, and today there is a surplus of new officers at the designated brigades. The new lieutenants are all competing for platoon leader positions; the result being that some are getting just six months as platoon leaders. The policy has garnered resentment against the women who are viewed as receiving preferential treatment and causing everyone, men and women, to get limited platoon leader time despite the fact that the women are just as unhappy with the policy as the men. Reportedly, one brigade commander has asked for the policy to be modified so that other brigades can be opened up for assignment of these new officers. In the National Guard, the problem is more extreme. Since the combat exclusion policy was eliminated in 2013 only two states have met the “leaders first” requirement. That means that in 48 states women still cannot enlist in infantry or armor occupations or be assigned to ground combat units at the entry level, almost five years after the elimination of the combat exclusion policy. The Army’s “Leaders First” policy hinges on several faulty premises. First, that it is a validated best practice. However, in the first years of women’s integration at the military service academies some academies pursued this logic and assigned women cadets to a handful of companies. The policy was quickly abandoned since men from companies that had no women were found to be far less accepting of their female classmates than those where women were assigned. Second, it rests on the notion that men can’t lead women without women coaches. This flies in the face of my three decades in the Army when I did not have a single woman as my rater or senior rater or in any supervisory position over me and it is insulting to male leaders to assume that they need women by their sides to coach and advise them on how to lead. Women are people, not alien Soldiers that require unique or special leadership traits from men. The only leadership trait that male leaders need is maturity, responsibility and the ability to evaluate Soldiers on merit. Finally, it places the burden of successful integration on women leaders. Assuming that a handful of junior women will not only coach their male leaders but simultaneously look out for other women in the unit is completely unreasonable. Ultimately, is it leaders, male leaders, and the organization who are responsible for successful integration, not young entry-level women who are trying to find their way in units that may or may not want them in the first place. This notion that women just need to “lean in” or “take a seat at the table” is highly problematic if the organization is not prepared to let them in in the first place. Leaders First is a failed pilot effort that should be abandoned immediately. When then-Defense Secretary Leon Panetta announced in 2013 that the Defense Department would open all military occupational specialties to women, he gave the services three years to come up with a plan. Ellen Haring is a retired Army colonel and she works at the Service Women’s Action Network.